The last thing my children need this Christmas is more toys that will be annoying, easily broken, or quickly tossed aside. If you're still shopping for Christmas gifts for your children, here are some ideas for affordable, educational, clutter-free gifts your children will love! Science Kits - Science kits aren't only educational, they're fun! 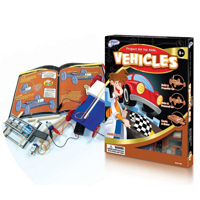 My children loved building their own moving car with this Vehicles kit from Bright Products, Inc. In the process, they also learned about the wheel, gravity and mechanics. CD's and Audiobooks - During afternoon quiet times and lengthy car trips, we enjoy listening to music and stories on tape. 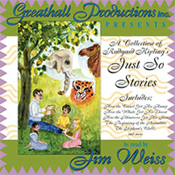 These award-winning recordings by Jim Weiss of Greathall Productions, Inc. are both entertaining and educational. This Christmas, my children will find recordings of Rudyard Kipling's Just So Stories and Sherlock Holmes for Children in their stockings. Art Supplies - Arts and crafts may cause a little clutter, but they inspire creativity and produce hours of fun! Give your children ready-made project kits like these craft kits from Klutz or a box of craft supplies that encourages use of the imagination, such as this Colossal Box of Crafts from Miller's Pads and Paper. Magazine Subscriptions - A good magazine subscription keeps giving month after month after month. Choose magazines that relate to your child's interest in science, nature, history or geography. My children enjoy reading everyone's childhood favorite, Highlights Magazine , and completing Highlights' Hidden Pictures Puzzles . Games and Puzzles - Games and puzzles are presents your entire family will enjoy for years. Every Christmas, we add to our collection by giving each child a puzzle or game. 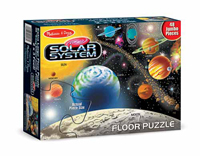 Our favorite puzzles throughout the years have been floor puzzles by Melissa and Doug . For more gift ideas, check out my all time favorite children's gift catalog - HearthSong ! This Christmas our family is receiving one of the best gifts of all - a new baby! As always, feel free to pass this newsletter on to friends and contact me with your questions or comments.